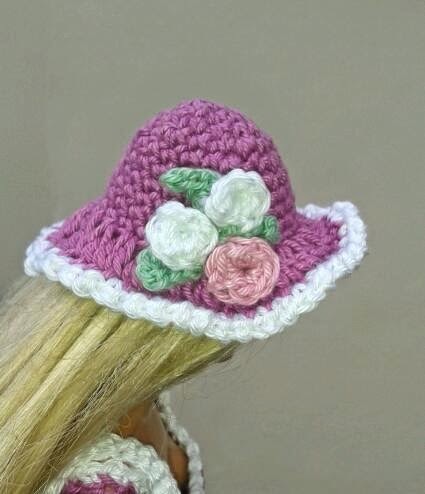 Its nearly Easter so I've crocheted a couple of bonnets for Barbie. If your crocheting is fairly tight you might have to go up a couple of hook sizes. Also I've noticed that other fashion dolls seem to have bigger heads that the latest Barbie (the model in photo) Its best to check your tension, but, as these little hats are so quick to make you can redo them in a flash if necessary. The pattern is below so please have a try and let me know what you think. If you find any typos or have problems with the pattern let me know then I can amend it. Using a scrap of green yarn make 6ch for leaves, sew on to hat, Sew motifs over leaves as shown on photo. To finish: Fasten off ends. What a treat, I love all of your designs. I crochet, but I would love to learn how to knit to make such gorgeous dresses. Thanks for you lovely comment. If you look online there are lots of youtube videos that show how to knit. Then you could start with a simple pattern like the barbie knitted dress.